Urban planners must take a myriad of different objectives into account when designing development programs. These can include optimizing a neighborhood's built density, preserving old monuments and buildings, using renewable energy, cutting CO2 emissions and minimizing costs – to name a few. These objectives are often contradictory and hard to quantify, and sometimes not fully understood. But Sébastien Cajot and Nils Schüler – two researchers in EPFL's School of Engineering Industrial Process and Energy Systems Engineering (IPESE) Group headed by Professor François Maréchal – have developed a novel approach to urban planning, called SAGESSE, and an associated software program to help urban planners out. Available as a web application, their program lets planners enter the criteria important to them and get a rapid overview of the different variants possible. Cajot and Schüler worked with the Canton of Geneva to develop their software, testing it out on the Cherpines and Palettes neighborhoods. The researchers' findings appear in Frontiers ICT. "For us, the current approach to urban planning gets things backwards. Planners typically outline four or five possible variants for a given neighborhood and then model them to quantify the impact of each," says Cajot, who just completed his thesis on this topic. However, urban planning requires coordinating the interests of many different stakeholders – such as property developers, city residents, energy planning officials and local representatives – who often have conflicting goals. "For any one goal, there could be millions of possible variants to achieve it," says Cajot. For instance, the aim of cutting CO2 emissions can be reached by renovating a city's building facades, installing district heating or replacing old boilers. But the methods currently available for assessing the impact of each option are limited – making it hard for urban planners to take well-informed decisions. "Urban planners should start not by asking whether they should build a high-rise building, for example, but by establishing the main goals they want to achieve, such as optimizing a city's density, improving its quality of life or managing development costs. Our software enables them to start from this basis and come up with the best variants," says Cajot. The program generates simple diagrams depicting the variants as horizontal lines plotted against vertical axes, where each axis is an urban development objective. 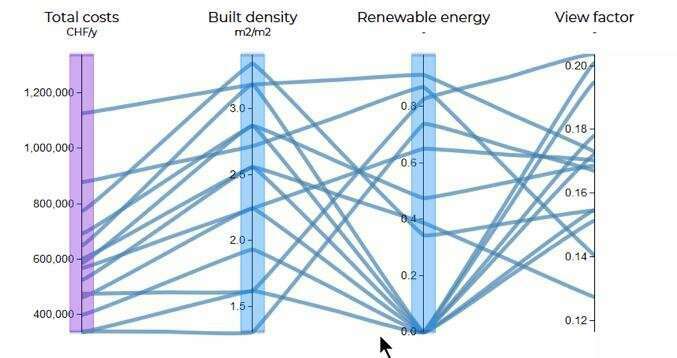 The diagram could reveal, for example, that a variant meeting specific cost and built-density targets does not comply with renewable-energy-use regulations or blocks the view from other buildings. In this way, urban planners can adjust their targets and objectives and eventually find a variant acceptable to everyone. The researchers initially tested their software on the development of the new Cherpines neighborhood, near Geneva. Then they tested it out on the existing Geneva neighborhood of Palettes, to see how it could help improve already built-up areas. They worked with local officials to determine what the urban-development priorities were. "They wanted to focus on increasing urban density, cutting CO2 emissions and protecting the local heritage," says Cajot. The researchers also factored legal requirements into their software, and designed it to be compatible with existing zoning documents, like master plans. Their software uses algorithms to weigh these various elements and calculate an array of urban planning options. In the medium-term, the researchers plan to launch a startup to market their urban planning software and approach. And the IPESE Group is looking into applying the technology in other fields, such as helping to implement Switzerland's energy strategy, planning out renewable-energy use and determining optimal biomass conversion processes.